Are wasps and yellow jackets ruining your family picnics? Don't like those industrial wasp traps from the hardware store that use dangerous chemicals? Try these classic Glass Wasp Traps made from a high quality thick glass in a classic beehive shape. These wasp traps are an all-natural way to control wasps and they hang beautifully in any garden or outdoor living space. A sturdy cork top keeps the pests from getting away and a stylish wire hanger adds to the appeal of this lovely trap. Not only do these wasp traps look good but they work great as well. Simply fill the inner reservoir with just a little soda or sugar water to attract the wasps and once they are inside they are stuck and you can enjoy your outdoor gatherings. Juice such as Apple Cider or Orange Juice will work great and they are particularly fond of tiny bits of meats like ground beef or roast beef if you have them in an area where the smell isn't going to bother you. They also feature legs so that these wasp traps can either be placed on a table or hung to protect your party. 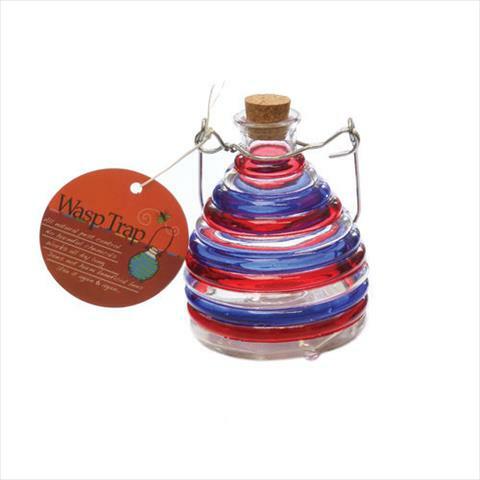 These wasp traps are stylish functional and don't require the use of harmful chemicals - an organic and natural way to manage wasps. BONUS TIP: Some apple cider vinegar and just a touch of dish soap hung over your sink in one of these will attract and kill fruit flies!